We give you all of our talent and time to make your family a true piece of fine art. You know you want some beautiful images, but what are you going to do with them? At Child's Play Photography, we begin with the end in mind. 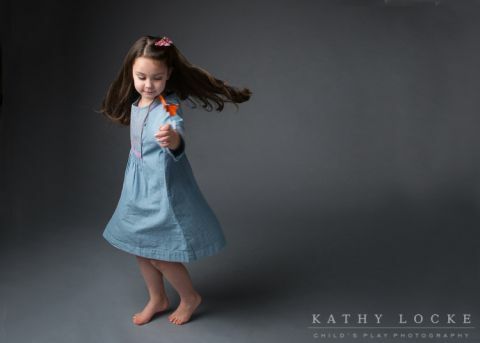 Before every session, Kathy meets with her clients in person or by phone, to discuss not only the style and design of the shoot, but also how they plan to display their images. She loves to collaborate with her clients. Do you have a tall skinny spot on your living room wall? Do you wish to tell your senior's story in a custom designed album? Do you want a studio or location shoot to accomplish that vision? Before Kathy ever picks up her camera, she has a strong sense of look, style and desired outcomes that are unique for every client. All seniors have an in person design consultation to brainstorm style location(s), outfit, etc, so we're completely on point the day of the shoot. Sessions are held in our studio at 146 N. Merchant Street, or a location of choice. We know that photo sessions can be a little bit stressful. 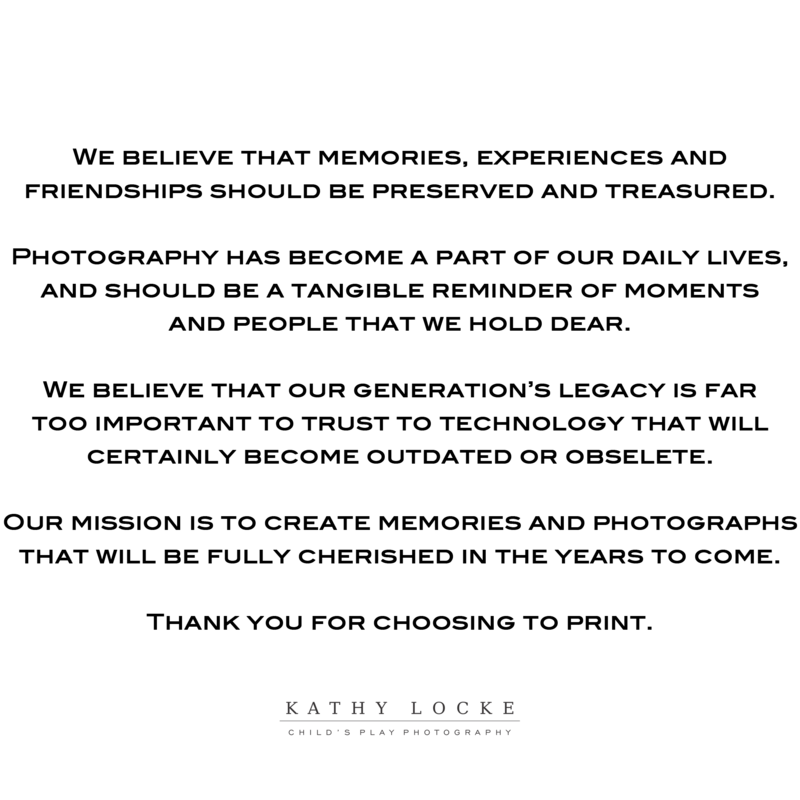 Not to fear, Kathy and her team have tons of experience in making the tiniest babies sleep, the shyest child smile, the grumpiest member of a family join the group or the most reluctant senior boy feel at ease. We promise to give you as much or as little time necessary to capture exactly what you have in mind (and more). Approximately two weeks after your session, Kathy will have you come back into the studio to view the professionally edited proofs. 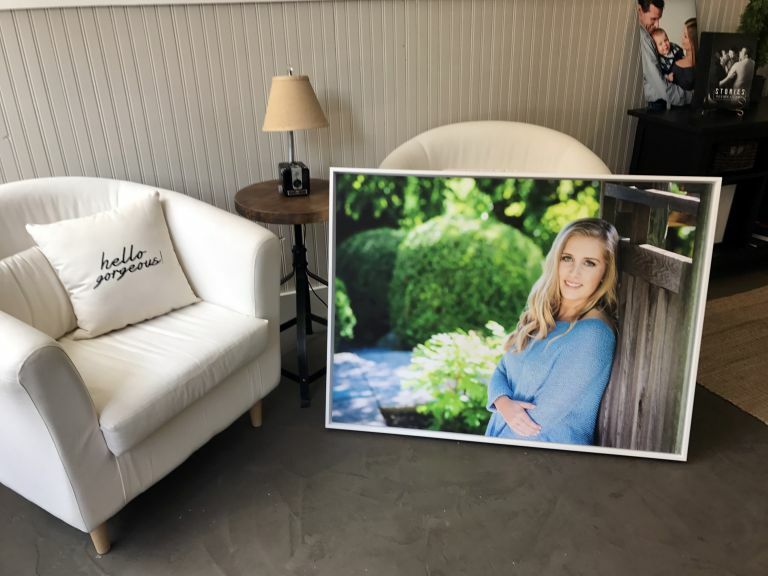 Using our state-of-the-art software, we will also be able to virtually show you what specific images look like on your home walls scaled to size (we have you snap a photo on your phone and send to us prior). Kathy works with you to select your favorite images, and design gorgeous displays for your home. We take great pride in offering a full line of archival and fine art quality photo products that are unique to photographers in our area. After an order is placed, CPP's talented staff closely scrutinizes every image and edits them to make certain every detail is perfect. We also custom design in-house beautiful photo albums, birth announcements, holiday cards and graduation invitations. We strive for 100% satisfaction of the final product (we want you to love it), and promise to re-do or replace an item that does not meet your expectations. This is what we live for: The moment our client views their finished piece of art. Your family is art! Copyright 2019 Child's Play Photography. All Rights Reserved.|ProPhoto Blogsite|Design by Northfolk & Co.